Individual lessons are a fun, relaxed, and efficient way to improve your skills while adding striking new images to your collection. A typical full day schedule runs 8:00 - 4:30, with lunch included. In the morning we visit local sites around Austin to shoot seasonally active insects in the wild. In the afternoon we work with live animals in the studio, ensuring that you take home your own professional-quality fine art images. A half-day session can be designed for either field or studio photography, as suits your inclination. Sessions are personalized to match your experience and equipment. Available topics include the technical aspects of operating your equipment, field methods for finding and working with live insects, the aesthetics of lighting and composition, and special techniques like focus-stacking and time-lapse videography. We can also target species of interest such as slave-raiding ants, stick insects, aquatic beetles, and honey bees in the hive. To inquire about a personalized photography lesson, email myrmecos.photos (at) gmail.com. I provide customizable photography workshops from one to three days in length. These events are often included as a special session coordinated with meetings of professional entomological societies. I travel internationally and can instruct in English or Spanish. Topics include: photography technique and equipment, lighting and flash, working with insects, insect photography on a budget, and focus-stacking. As an example of the photographs I can help you create, see these recent participant results from a week-long photo workshop in Belize, and from a Saturday course in Guelph. Contact myrmecos.photos (at) gmail.com for more information or to arrange your event. See also the BugShot Insect Photography Workshops. I am happy to offer presentations on natural history or photography to clubs, libraries, schools, and other organizations. Some local educational presentations are free of charge - please email me (alwild@myrmecos.net) for details. May 9-12, 2019 - BugShot/California Insect Photography Workshop - registration now open! 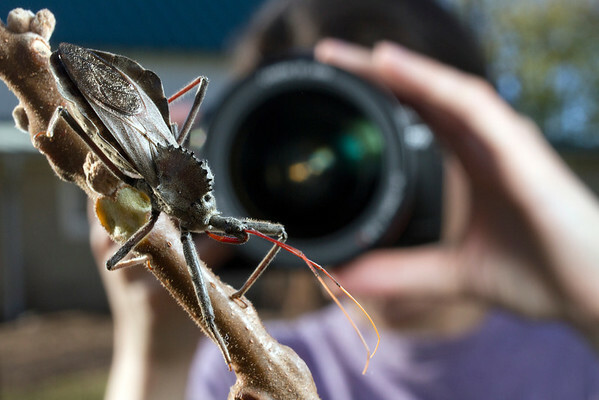 August 17-24, 2019 - BugShot/Ecuador Tropical Insect Photography Workshop - registration now open!